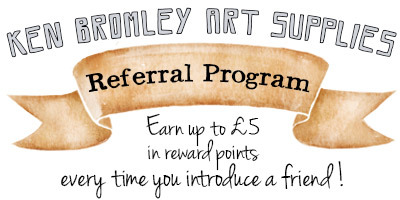 Earn up to £5 in reward points every time you introduce a friend to Ken Bromley Art Supplies! Here at Ken Bromley Art Supplies, we pride ourselves on providing excellent service. As a result, many of our customers recommend us to their friends who are looking to buy art materials. As a way to say "thank you" for your support, we have launched a referral program which rewards both you and the person you refer. In brief, whenever you refer someone to our website and that person places an order, we'll reward you with up to £5 of reward points, and we'll also give the person you referred 5 times the usual amount of reward points for their first order! To participate, you'll need to have registered an account with this website. Once logged in you can see your personal referral code page.